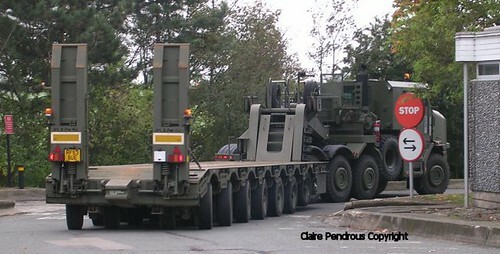 British Army HET (Heavy Equipment Transporter), originally uploaded by Lady Wulfrun. Heavy Equipment Transporters (HET's) are capable of carrying a 70-ton Main Battle Tank on board. They can move their load rapidly and cost-effectively, saving wear and tear on the tracks – and the roads. The semi-trailers are equipped with a heavy-duty winch – giving an all-up weight of 104 tons. The new Heavy Equipment Transporter is the most powerful tank transporter in production. It consists of an Oshkosh 1070F 8x8 tractor truck and a King Trailer GTS 100 seven axle semi-trailer. The fully integrated power pack, comprises of a Caterpillar C18 after-cooled, turbocharged diesel engine developing 700hp, and is linked through to an electronically controlled X300 transmission unit.